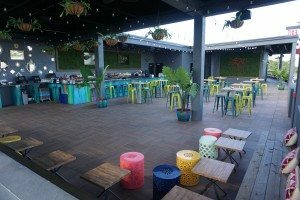 Society, a new modern American restaurant at Bell Tower Shops in Fort Myers, invites the community to the grand opening of its rooftop bar, Treehouse, on Thursday, Dec. 7. Throughout the evening, guests can enjoy live music with a special performance by local band, Sekond Nature from 7 to 11 p.m., in addition to Treehouse’s happy hour specials offered from 4 to 7 p.m. including $2.50 domestic beers, $4 well drinks and $6 house wines by the glass. Located on the restaurant’s second story, Treehouse’s open-air lounge offers a tiki-chic appeal featuring tropical cocktails made with the finest, freshest ingredients, a Pacific Rim-inspired raw bar menu, and live acoustic performances in the evenings seven days a week. The vibrant rooftop setting invites guests to gather at high-top tables facing the stage, mingle by the main bar, lounge on natural wood benches by the rooftop herb garden, or host a small cocktail event around an inviting fire pit. The Treehouse offers a great venue for group events, include “The Backyard,” a semi-private lounge area with a firepit and conversational seating. In addition to Treehouse’s rooftop experience, Society also offers multiple dining environments downstairs, including an outdoor garden setting on The Patio, and banquette seating and a bar in the main dining area where foodies can enjoy Society’s chef-inspired menu that features the award-winning culinary talents of Executive Chef Todd Erickson, a champion of the hit Food Network show, Beat Bobby Flay and an alumnus of the Culinary Institute of America in Hyde Park, New York. Private dining opportunities are also available in the intimate Executive and West dining rooms. Located at 13499 Bell Tower Drive at Bell Tower Shops in Fort Myers, Society serves lunch daily from 11:30 a.m. to 2:30 p.m. with light bites available from 2:30 to 5 p.m. Dinner is served from 5 to 10 p.m. Sundays through Thursdays, and 5 to 11 p.m. on Fridays and Saturdays with a late-night-bites menu available on weekend nights. Happy hour is served 4 to 7 p.m. daily. For more information, visit www.societyfortmyers.com or call 239-334-0900.